Silica, or also known as quartz, is a common mineral found in different materials common on construction sites, such as sand, soil, granite, masonry, rock, and landscaping materials. The modern science has discovered some positive effects of silica on human health. All the research conducted in the past had its focus on explaining the toxic effects of inhaled crystalline silica, but several new studies have explained a lot about this mineral, which is available in different forms actually. Thanks to several interesting benefits of this mineral, you can now find silica tablets and supplements in the market. The question is, "What are the specific benefits of using silica vitaminand supplements?" Keep reading to find out yourself. Silica vitamin has direct connections to strong and healthy connective tissue, which means it can be quite beneficial for the muscles, hair, tendons, bone, cartilage, and skin. It is possible to have a closer look at your skin to identify silica deficiency symptoms. The most common symptoms are weakened hair, dry skin, weakened teeth, heart pain, and weakened gums. Here are detailed explanation of Silica tablet benefits and side effects. It is important to take about 50mcg of silica every day for better results; however, you should combine supplements and dietary sources as well. You can pick foods from the following list and opt for a silica supplement that contains the herb horsetail. You can improve the intake of silica by opting for foods like raw cabbage, cereals, apples, carrots, peanuts, cucumber, onions, bananas, pumpkins, unrefined grains, honey, mangoes, oranges, oats, while wheat, green beans, brown rice, while-grain bread, beer, red wine and almonds. Hard water contains higher levels of silica as compared to soft water. Plant foods contain more silicon as compared to animal foods. Most silica supplements are made using horsetail, but some also use silicon dioxide. It is a good idea to talk to your doctor before using a silica supplements. 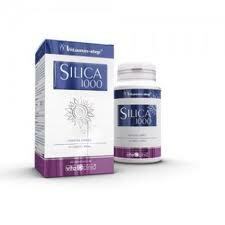 You will be better off taking horsetail silica supplements instead of using silicon dioxide supplements. For horsetail supplements, it is still important to consider the species of herb horsetail used in manufacturing. The Equisetum arvense is the safest choice for short-term use, and the most dangerous is the Equisetum palustre. Also, avoid using silica supplements if you have diabetes because it can lower blood sugar levels. Moreover, silica supplements may interact with other medications. For instance, you shouldn't use silica supplements if you are taking water pills because silica works as a diuretic. If you're on a nicotine replacement therapy, you should avoid using silica supplements that have low levels of nicotine. Moreover, the extended use of silica supplements may cause vitamin deficiency, which is mainly because it contains thiaminase, which plays a role in breaking down vitamin B1. "The product really helped me with my hair. I tried a number of things before I bumped into this product, which I really think works like magic. I use it with Natrol Biotin 10,000 mcg. My hair definitely grew due to the use of this product because I believed that my hair wasn't growing the average 1/2 inch a month on its own. I measured my hair after using both the biotin and the horsetail for a month and I could notice an extra inch added to the original length of my hair. I could also notice some volume added to my hair, which could be from the biotin though. There are also other forms of silica, such as liquid silica. It also supports the connective tissue in your body and helps with hair and nail health. However, you should also consult your doctor before using. "I've been using this supplement for a year or so now and it really helped resolve my hair loss problem. My hair grew profusely after its use; in fact, I could see a 6-inch increase in length in 3 months, which is just outstanding. What I was using was in capsule form, but now the same product is available in liquid form as well. Most health stores stock this product, so it is quite easy to find one. I switched to extra after a while. It was even easy to use it – you have to add 8 drops of the liquid in a 4oz glass of water and drink it daily. I was really happy to see that my hair was about 10 inches long. I stopped using it though because I was finding it difficult to manage my long hair. The fact of the matter is that if you want to know how effective the product really is, I'd say it's the best thing I found in years. I'd highly recommend it, but only for growing your hair long – it's not going to do much if you're looking for something that would add thickness to your tresses."